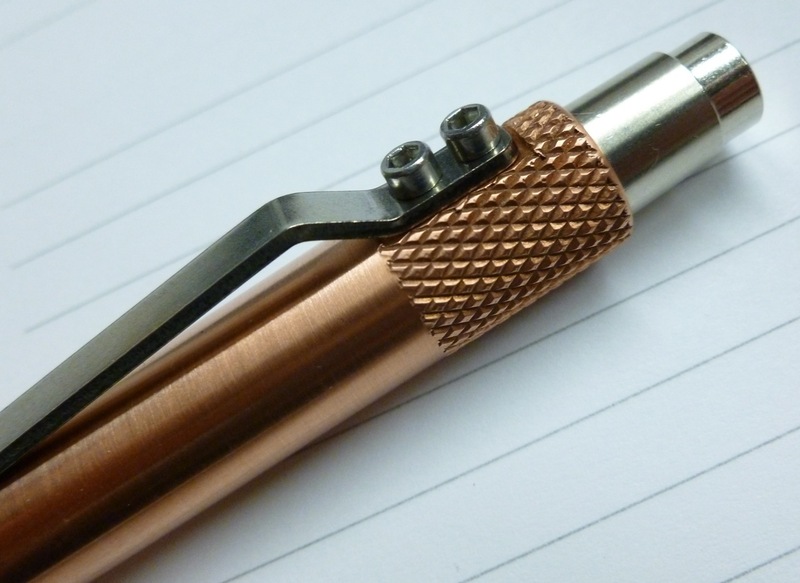 Note: Karas Kustoms provided me with a pre-production prototype of their newest pen, the RETRAKT (copper version), for evaluation and play. 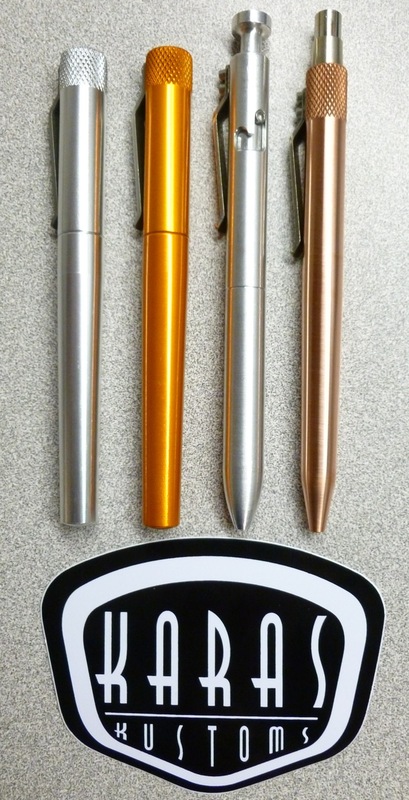 All other Karas Kustoms pens mentioned/shown in this review were purchased by myself. I’m obviously a fan, but I promise to tell it like it is. And though I received this prototype free of charge, I’m also a backer. With that bit of business out of the way, let’s get to the pen itself. The RETRAKT is a custom-machined pen body (refill not included) available in anodized aluminum, and hand-finished/raw brass and copper. I have the copper version, and it is a looker. Great finish, unique color that will develop an antiquey patina (AND it smells like pennies). It is ALSO quite heavy, weighing in at about 63 grams (2.25 ounces)…as measured on the same scale that I use to weigh spaghetti (so take those weights with a grain of salt). The copper RETRAKT certainly is a SOLID PEN. 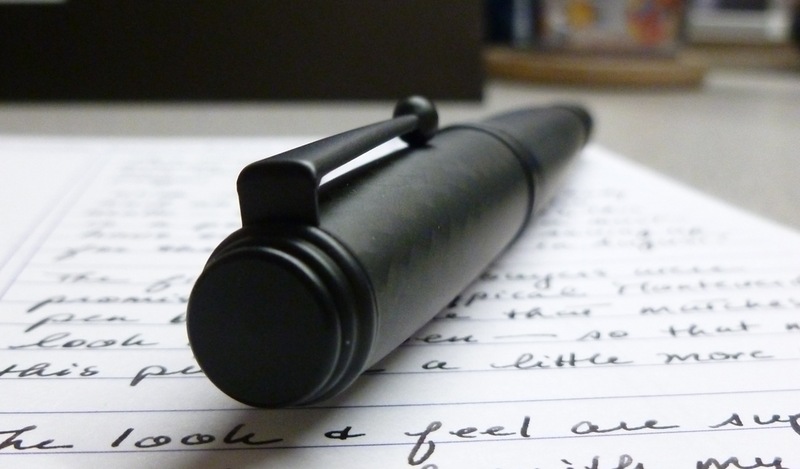 For all of its weight, I don’t find it unwieldy to write with. Granted, I haven’t written pages and pages in one sitting, but I’ve been using the RETRAKT to make notes for this review and I’m none the worse for wear. 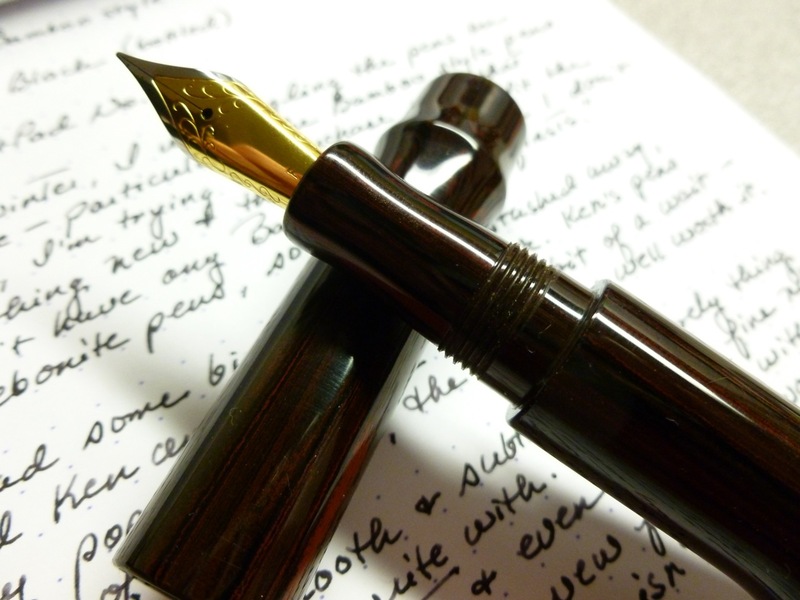 The weight seems to be distributed in such a way that the pen sits solidly in the cusp of my hand and doesn’t list forward or backward. Should you desire something less weighty, consider the aluminum version. But keep in mind that the copper looks really cool, AND exhibits anti-bacterial properties. (It’s true! Google it!) The RETRAKT looks great and it’s good for you! The RETRAKT sports the iconic stainless steel Karas Kustoms clip, the same one you’ll find on both the Render K and the Bolt. 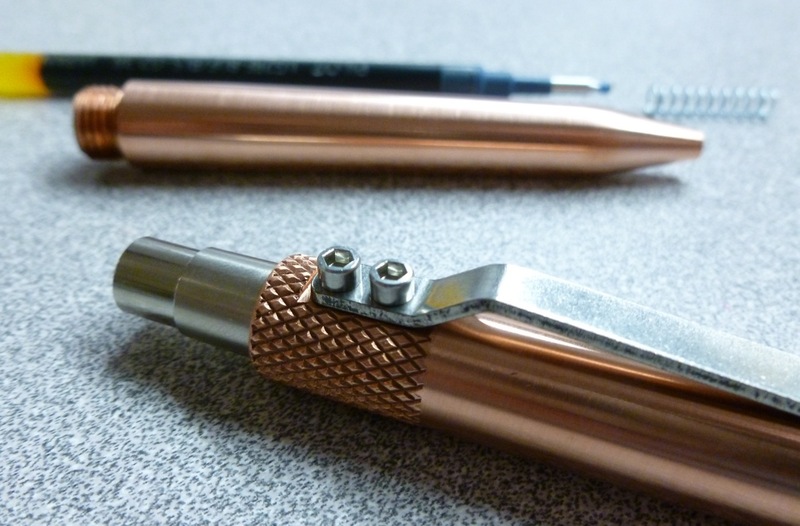 It’s super sturdy and attached to the knurled section of the pen via two set screws. I regularly slip one of my other Karas pens into a jeans pocket and have never had a issue with the clip not doing its job. Let’s get to what makes the RETRAKT retract. Tricked out with a German-made, all metal knock, the retractable mechanism engages smoothly and quietly. Yes, quietly. Using a ball-bearing and groove system, rather than a cam, makes the difference. 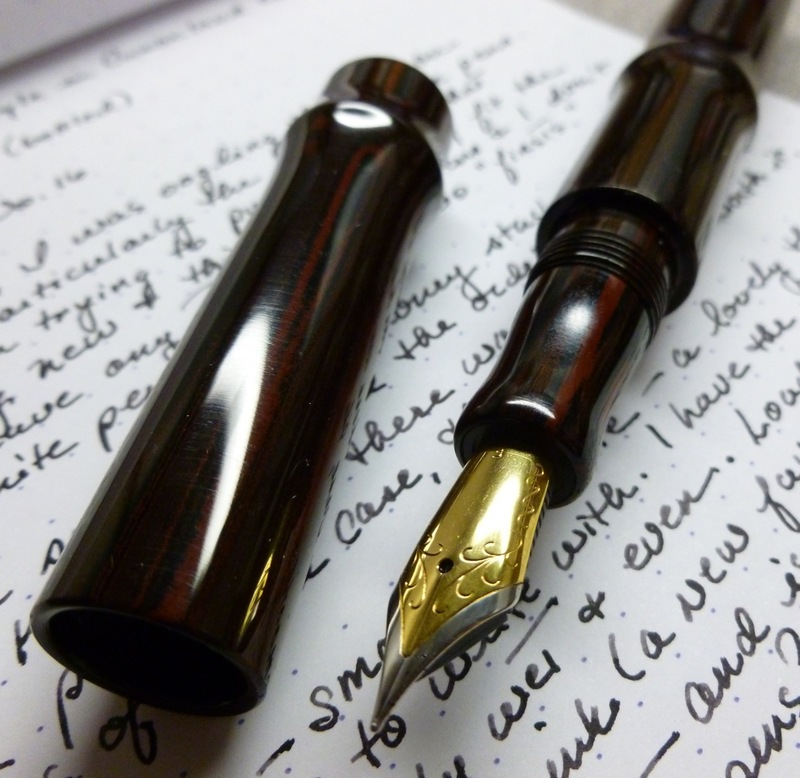 The knock itself is rock solid…no wiggling or wishy-washiness…and will surely survive my compulsive pen clicking habit. 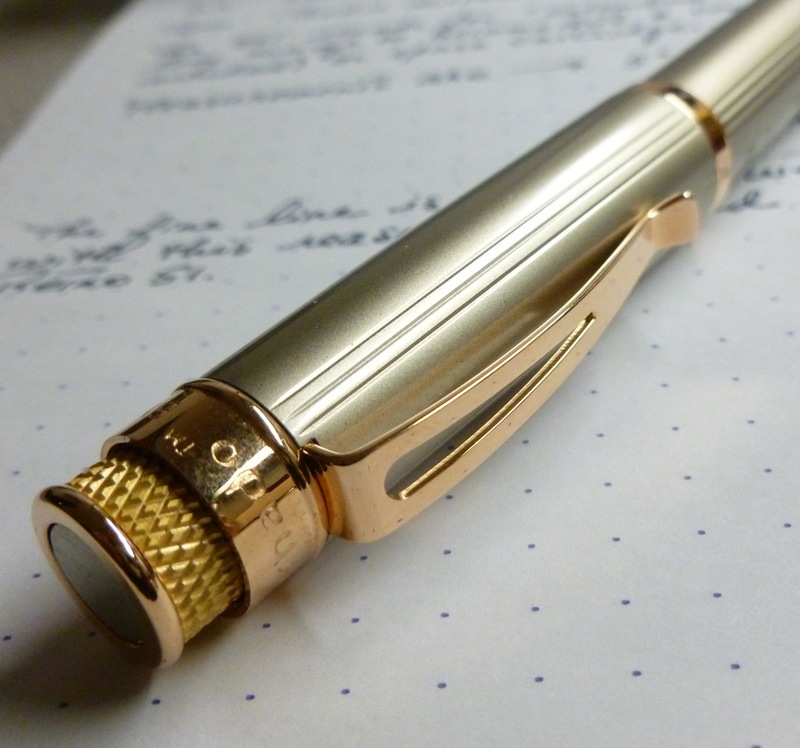 And because the pen is retractable, there’s no cap to post or set on your desk. Retrakt. Write. Retrakt. Another feature to note is something that you DON’T see…branding. Their pens are sleek and industrial and YOURS. You’re not using and carrying a billboard for the company. 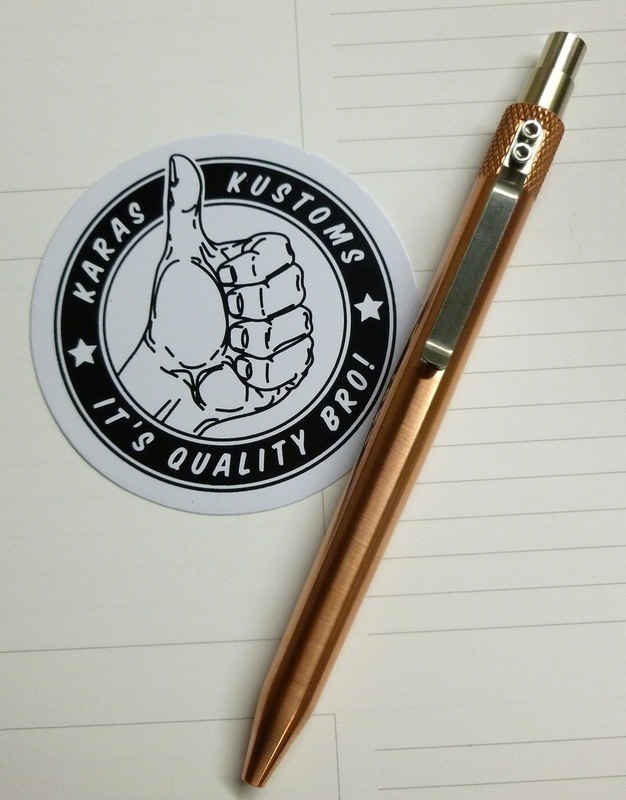 Karas Kustoms design aesthetic and build quality speak for themselves, without the pens saying a single word. So clean, so cool. I’ve been a fan of Karas Kustoms since their first Kickstarter project, the Render K. Backing their second project, The Bolt, was a no-brainer. Both experiences set the bar high for all other Kickstarter projects. With frequent updates and mesmerizing production videos, they bring their backers along for the ride, so you’re never in the dark wondering where a project stands. I was impressed then, and I remain impressed with this latest addition to the Karas Kustoms pen family. Intrigued? Want to know more? Check out the RETRAKT Kickstarter page HERE. Levels start at just $30 for the EARLY BIRD aluminum offering (while they last!) all the way up to $250 for an on-site visit to the Karas Kustoms shop, complete with lunch and an aluminum RETRAKT. SO, I was a goner, despite my plan/pledge/vow. 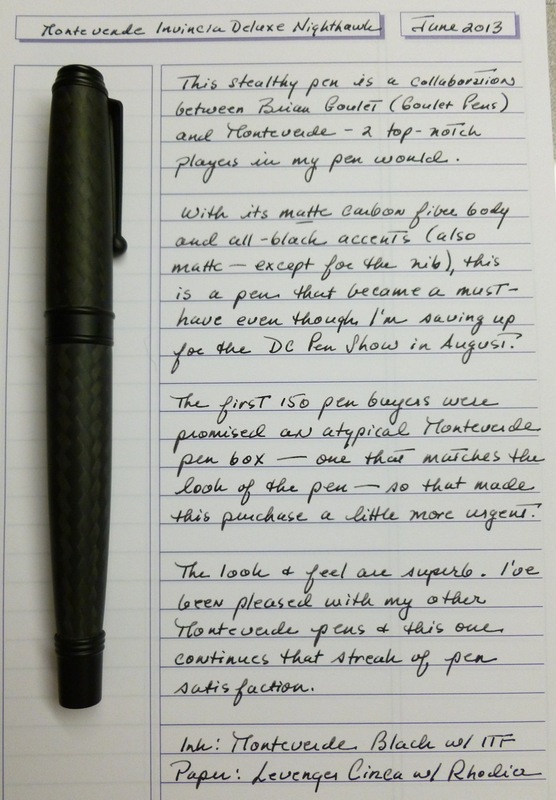 My Monteverde Invincia Deluxe Nighthawk (F nib) arrived last week, and it hits all the right notes. I loaded the included converter with Monteverde Black ink (with ITF), and doodled away. Very smooth. Very stealthy. Very, very cool. This pen is a collaboration between Brian Goulet/Goulet Pens and Monteverde Pens, the details of which are found in this article and video. Brian explains the details better than I can, but I can tell you that I love the outcome of their work. I own a handful of Monteverde pens, and have never been disappointed in their looks or performance. 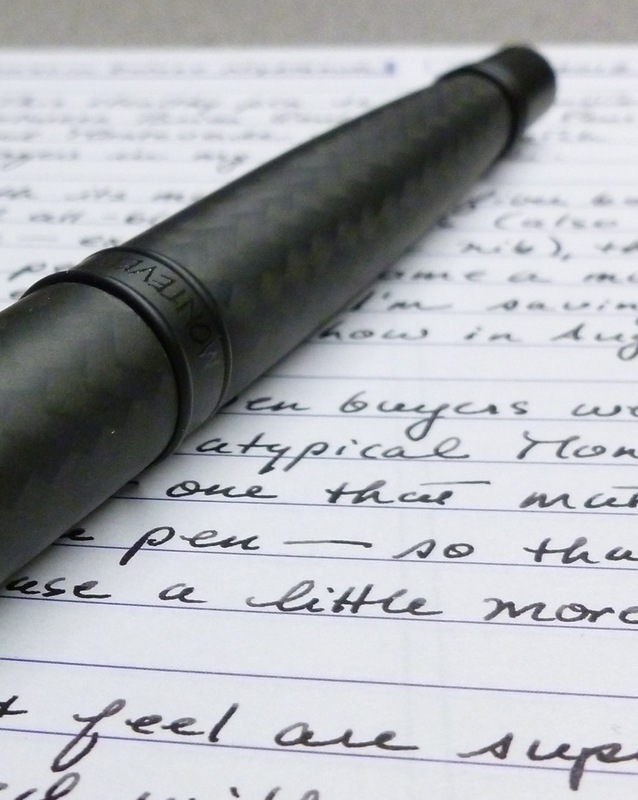 They’re solid, reliable, good-looking pens, and this one may be the best of the bunch. Because it pushes all of those buttons that I listed above. This may well be the stealthiest pen that I own. 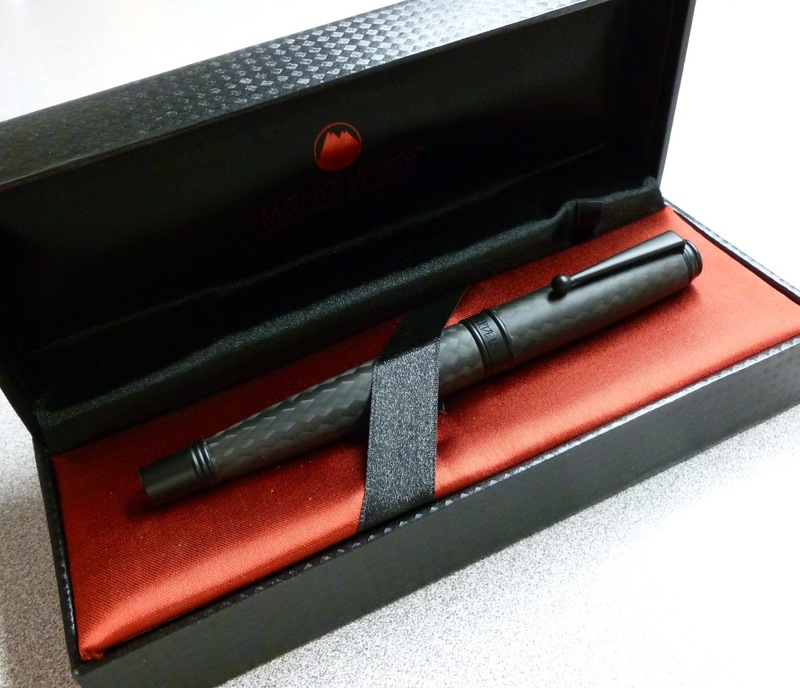 With the matte carbon fiber body and all-black trim, the pen is so subdued looking that it’s impossible to ignore. So it’s stealthy, yet stands out in a crowd. Which is a very cool trick. The black fine nib writes wonderfully. 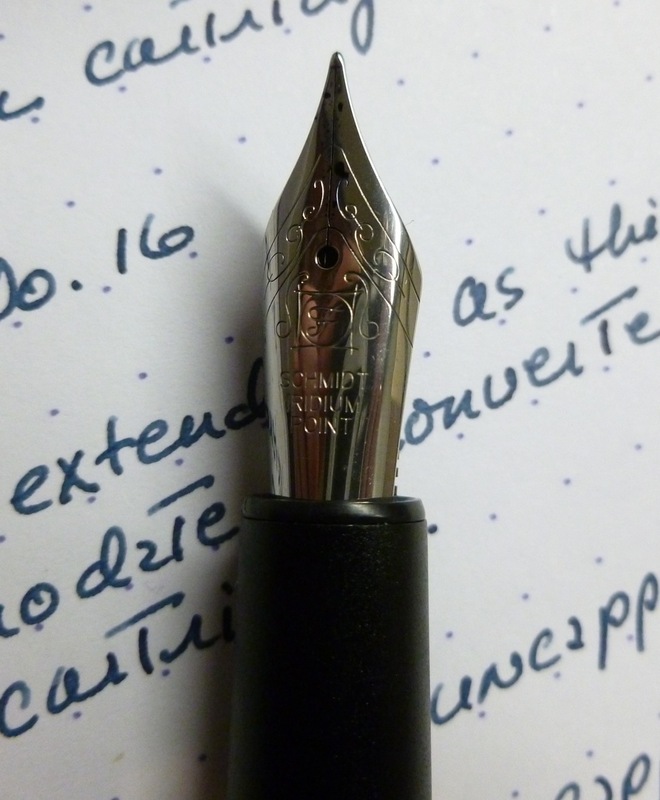 Coupled with the Monteverde ink, which I’m trying for the first time, the writing experience is a true pleasure. Effortless and nicely liquid. Wet, but not too wet. Just right, really. Had they outfitted the pen with a matte black nib, rather than the shiny one, that would’ve bumped the awesomeness up one more notch. But I’m not complaining. Looks a little like a pen wake, doesn’t it? Though this isn’t a limited edition pen, the first 150 customers were promised special packaging, which is another reason that I made my purchase quickly. Rather than the usual green Monteverde box, this one came packaged in a black and red box that coordinates very well with the pen. Normally I don’t really care about packaging, but the carbon fiber-esque look of the box reeled me in like a pen-loving trophy fish. If there were such a thing as pen-loving trophy fish. Normally Monteverde pens sport their mountainous logo (in white) on the end of the pen, but that’s been dropped from the Nighthawk. The pen is branded with slightly raised black lettering on the center band, which completes the totally blacked out look. The stealthiness of the Nighthawk is certainly in the details. 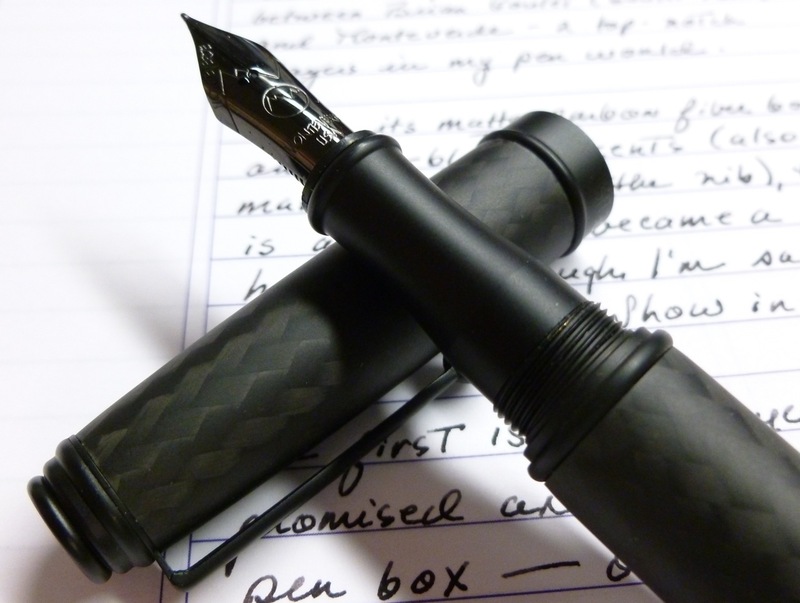 At 40 grams, which is about 2.5x the weight of a Lamy Safari, the capped pen is heavy, but in a very well-balanced way. I find the cap difficult to post, but that’s not an issue for me because I wouldn’t post it anyway, due to the weight of the cap (10 grams). The uncapped body measures 136 mm (5.35 inches) and is comfortable in hand. I’m really impressed with the whole package…the weight, looks, feel, packaging, and performance. Who can resist the charms of the Nighthawk? 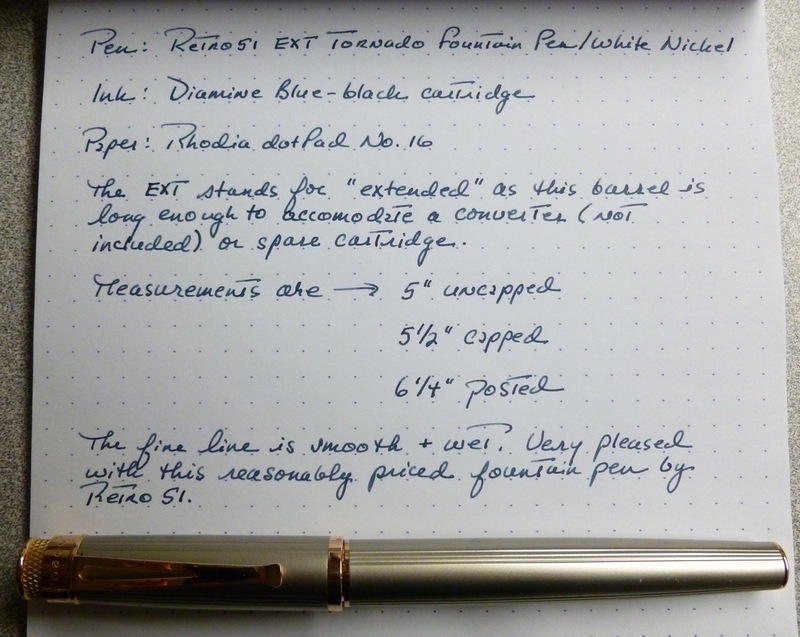 Not I. Nope, not I.
I have my fair share of Retro 51 Tornado rollerballs (and it is SO tempting to collect ALL THE COLORS), but I recently did a little exploring in the Retro 51 universe and discovered this non-rollerball option- the Retro 51 EXT Tornado White Nickel Fountain pen. 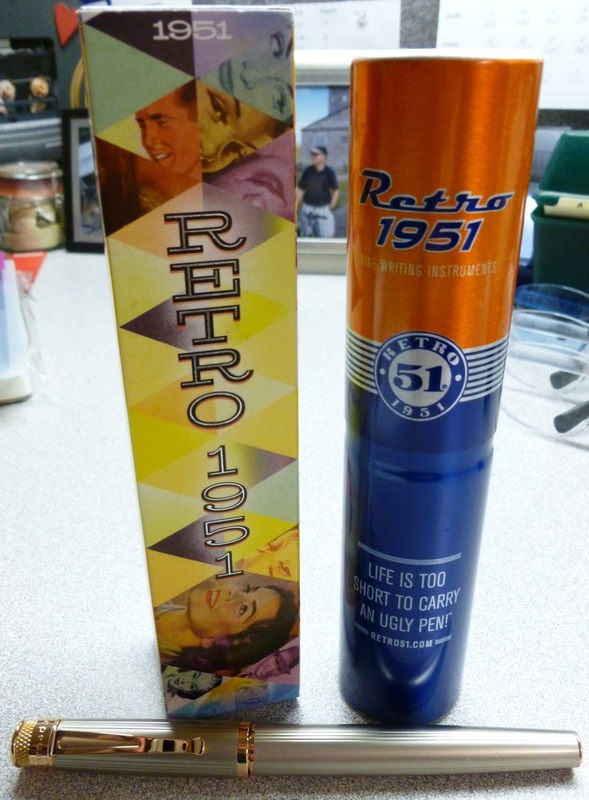 The price is reasonable, and I liked the idea of taking a little detour off of the Retro 51 rollerball trail. There are familiar elements, like super-cool packaging. 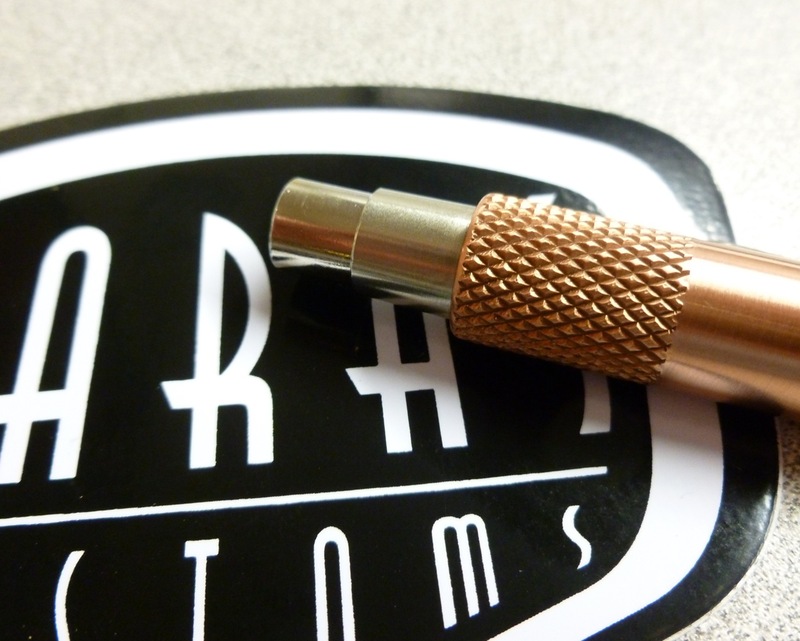 And the iconic Tornado clip and knurling. In this case, the knurling is for decorative purposes only as there is obviously no “twist-action” needed for this capped fountain pen. I’m a sucker for stealthy looking, dark pens, but the white nickel finish on this Tornado is a nice change of pace. With the gold-colored accents (they look slightly pinkish to me, though others disagree) and fine accent ridges, the look is fresh and clean. 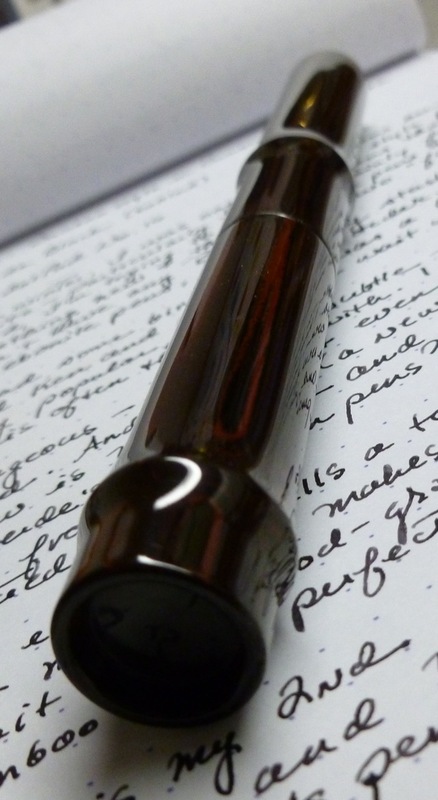 Though the cap does post, I find that this makes the pen feel a bit top-heavy, so I’ve been using it unposted. The weight is “medium” (one of these days I’ll get a balance for exact weights)…substantial feeling but not heavy. Kind of a “just right” weight. The black plastic section is smooth but not slippery. The only slightly niggly issue I have is that I sometimes find that the screw-on cap cross-threads, and I have to back it off and try capping again. This could very well be an issue with this particular operator rather than with the pen. So glad I took this little detour off of the Retro 51 Tornado Rollerball highway. It’s been a very fun ride. *Well, what do you know?! I just popped open the metal cigar tube that the pen comes in and noticed a little something tucked at the bottom. IT’S A CONVERTER! So it IS included, and I stand corrected.